The leaf margins are entire and revolute. In Weber & Wittmann (2012) and Ackerfield (2015) this collection will key to Artemisia ludoviciana Nutt. var. ludoviciana, because of the entire leaves. However, in FNANM, revolute margins lead one away from subsp. ludoviciana, perhaps in the direction of subsp. mexicana (Willdenow ex Sprengel) D. D. Keck. Most of the collections of A. ludoviciana Nutt. 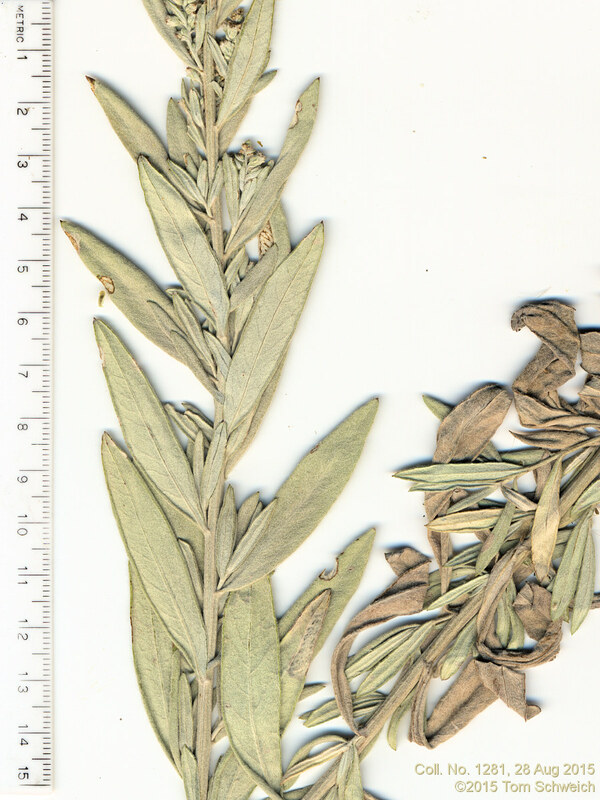 in Jefferson County, Colorado, are undetermined as to infraspecific taxa, and considerable variation in leaf margins and lobes can be seen in the specimens. Field Notes: Coll. No. 1281, 28 Aug 2015. Other photos about Species - Asteraceae or Artemisia ludoviciana.